Your wedding day is important and is a fun day for everyone. 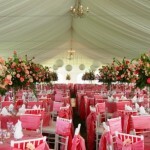 If you are conscious of the environment, you may choose to have a wedding that is environmentally friendly. Going green for your wedding is a great way to celebrate and preserve the environment. You can be eco-friendly in small ways or have the majority of your wedding be that way. The following tips and ideas will help you make choices that will be friendly to the environment. As an alternative to buying a ring at a major jewelry store, you can buy antique/vintage rings, or use rings previously worn by members of your family. There are a few options for an eco-friendly wedding dress. You can find organic vegetable-dyed fabrics for the dresses of not only the bride, but also the flower girl and the bridesmaids. You can buy attire made of hemp silk at www.getconscious.com. The gowns come in various styles and prices are from $700 and up. For invitations and thank you cards, there are a variety of papers from which to choose. Check out recycled paper or paper made from 100% cotton and use vegetable dye. Also look at Invitations by Dawn for the Naturally Ever After paper line. It is easy to find catering companies that use organic ingredients and ingredients from local sources. Look for companies that get their chicken and fish from certified sustainable resources. Use organic cut flowers or consider dwarf trees or potted plants as an alternative to flowers. Check out florists for Fair Trade flowers. Use 100% soy candles and recycled glass votives. Visit a local farmer’s market and talk to candle makers. They may offer a discount for a large order. A centerpiece can be made by using small seashells to outline a heart in the middle of the table and putting a votive candle in the center of the heart. If you put out candies or mints on the tables, use candies that are certified Fair Trade or organic chocolate. Find a nice variety of chocolates, jelly beans, and mints at Natural Candy Store. You can even plan an eco-friendly honeymoon. Go online and check out World Wildlife Fund. It will list travel options and partners. Instead of a bridal registry for the traditional wedding gifts, think about requesting that your guests make charitable donations in your honor. These days protecting the environment is on the top of many people’s minds. Planning an eco-friendly wedding will help you significantly in organizing a memorable event that you will not just enjoy but will inspire others aswell. You will have a great day and also know that you are doing your part to save the planet. Crystal is a blogger with great interest in writing in cooking and baking. She loves to bake fresh cup cakes and loves to decorate them with cupcake wrappers for a lovely presentation.